The story of the decimation of the Royal Flying Corps over Arras in 1917 As the Allies embarked upon the Battle of Arras, they desperately needed accurate aerial reconnaissance photographs. But by this point the Royal Flying Club were flying obsolete planes. The new German Albatros scouts massively outclassed them in every respect: speed, armament, ability to withstand punishment and manoeuverability. Many of the RFC's pilots were straight out of flying school - as they took to the air they were sitting targets for the experienced German aces. Over the course of 'Bloody April' the RFC suffered casualties of over a third. The average life expectancy of a new subaltern on the front line dropped to just eleven days. And yet they carried on flying, day after day, in the knowledge that, in the eyes of their commanders at least, their own lives meant nothing compared to the photographs they brought back, which could save tens of thousands of soldiers on the ground. 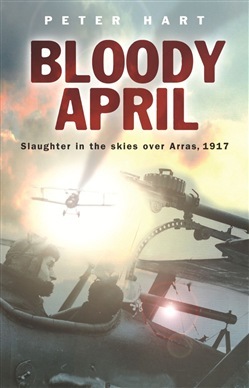 In this book Peter Hart tells the story of the air war over Arras, using the voices of the men who were actually there. Acquista Bloody April in Epub: dopo aver letto l’ebook Bloody April di Peter Hart ti invitiamo a lasciarci una Recensione qui sotto: sarà utile agli utenti che non abbiano ancora letto questo libro e che vogliano avere delle opinioni altrui. L’opinione su di un libro è molto soggettiva e per questo leggere eventuali recensioni negative non ci dovrà frenare dall’acquisto, anzi dovrà spingerci ad acquistare il libro in fretta per poter dire la nostra ed eventualmente smentire quanto commentato da altri, contribuendo ad arricchire più possibile i commenti e dare sempre più spunti di confronto al pubblico online.